As soon as were on the lush, green hillside a sense of peace and quiet settled upon us like the weight of a heavy blanket. It was the same sort of hush that you sense upon entering the sanctuary of cathedral or a church. It was clear to me in that moment that this was a sacred space. The Hill of Tara is ensconced in Irish history and mythology. 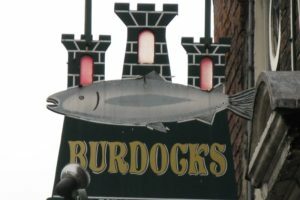 It is widely thought to be the seat of political and spiritual power in Ireland until the 6th Century, and all of the Kingship ceremonies took place here during this time. 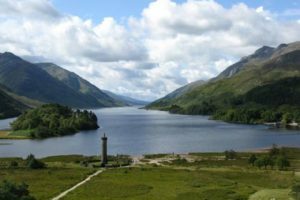 In the hazy mist of myth and legend, Tara was also the home of the Tuatha De Danann, the people that were thought to inhabit Ireland before the Celts came. There were stones with Celtic carvings all the way around the tomb. I could envision the hill as a center of life and of ceremony, with people living around it and coming to the formidable hill for ceremonies and other important events. Even in the rain (which unfortunately picked up as soon as we got out of the bus) our stop at Tara was a glimpse into Ireland’s ancient history and a great chance to experience the heart of Ireland firsthand. It is evidently clear why ancient people chose this hill as the center of Ireland. From the top of the hill on a clear day you can see half of Ireland. It would have given the Irish leaders of the time a formidable and commanding presence and a solid seat of power for the Irish Kings of old. forget about them, and leave them in a bleak, dark winter for eternity (wow, sounds a lot like a normal winter in Minnesota!) 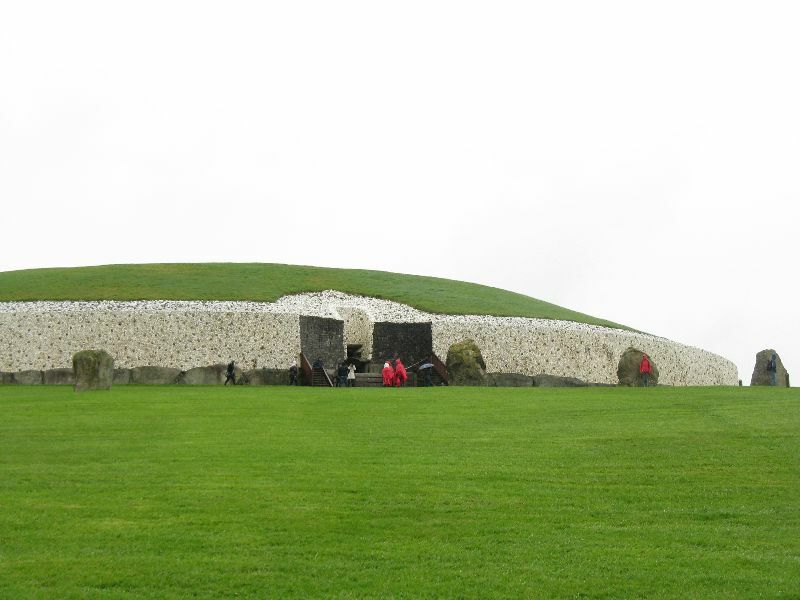 The passage tomb at Newgrange was perhaps built to honor the Gods so that warmth and light would return. Newgrange is an passage tomb built by Neolithic people 5,500 years ago, and it is part of the Bru Na Boinne complex of ancient tombs and sites. 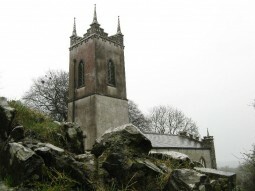 There are 39 separate tombs located within the Boyne Valley, making this a great place for ancient history lovers. Newgrange is the oldest building still standing in the world (older than Stonehenge or the Pyramids) and it was thought to have been used for ceremonial purposes. 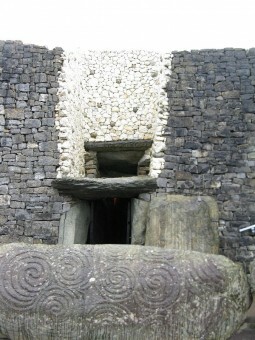 The opening and entrance stone at Newgrange. Note the cool Celtic carvings all over the stone. One of the most remarkable features of this structure is the fact that it is aligned so that on the morning of the Winter Solstice each year, the sun shines down the passage and illuminates the inside of the burial chamber. The light entering the chamber was simulated during our visit, and it was an awe inspiring experience for me, so I can’t even imagine how it would have seemed to a stone age person who had never been exposed to the modern marvels of our time. No one knows for sure what Newgrange was used for. It is thought that it was built by the ancient people to help them plan and anticipate when to plant crops. These stone age farmers were the very first astronomers, as the astrological cycles were vitally important to understand in order to time the planting of crops correctly. 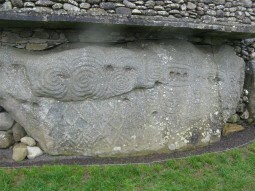 Newgrange was also used as a burial chamber. Inside are carved stone bowls, thought to have been places where the ashes of the tribe’s ancestors were kept. Perhaps it was believed that the spirits of their ancestors could travel on the beam of light, or that the beam of light would provide eternal life for them. Newgrange was truly a place where the sky and the earth, death and rebirth were all united, and visiting was an experience that I will never forget. Together, Tara and Newgrange are two of the most important sites of ancient Irish history and they make up the spiritual heart of this amazing country. 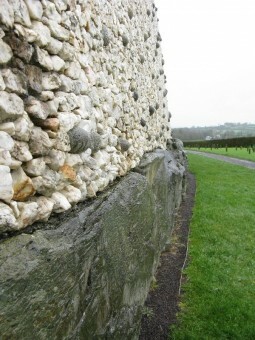 The wall at Newgrange is the only part of the tomb that has been reconstructed. The rest of the tomb is in its original condition since the stone age! If you are a history lover, a tour of Newgrange by Mary Gibbons will be a highlight of your trip to Ireland. It is very clear that Mary is an expert in Irish history. For those who love learning about the history of a place in depth (or if you are the kind of person who loves to ask a lot of specific, detailed questions) Mary will have an abundance of information to satiate your hunger. The tour was well organized and we were picked up from a convenient point in Dublin. For anyone looking for an easy way to incorporate this must see Ireland experience into your sightseeing in Dublin, Mary’s tour is an excellent choice. If you have your own vehicle, driving yourself is also an option (though you would miss out on the fascinating historical commentary on the sites). 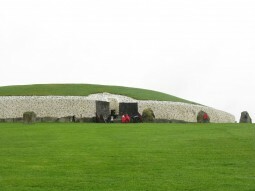 To drive to Tara and Newgrange with a few stops in the middle would take an afternoon. The entrance fee into Newgrange includes a nicely narrated tour about the historical significance of this ancient site. If you decide to go by yourself, get to Newgrange early as there are only a limited number of entries allowed and if you arrive late in the day, you might have to wait for a while for your allotted time or you may not be allowed to get in. This is part of the advantage to taking Mary’s tour-you will not have to wait as she already has a time slot designated for your visit. Newgrange is a must on my list of things that you must see in Ireland . 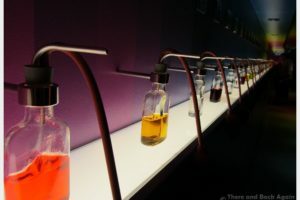 Have you even been here? What were your impressions?